Not Knitting, Not Sewing, Either! One, Two, Buckle My Shoe..
A 1,000 Posts! And It's My Birthday, Too! An inch more added--(the shawl is about 15 inches in diameter now) And yet, it seems like hardly no noticeable progress. There's a new life line, and a bunch of new markers—one every pattern repeat, too, so I guess there is some progress. Chart 1 had 10 repeats, chart 2, 3 repeats for every one of chart 1. Chart 3 has 1 repeat per repeat of chart 2 (still 30 repeats)--but chart 3 is a double feather—so there will be 60 feathers in this go round. I decided to change this chart—slightly-- and make the stems portion a few rounds longer. The chart calls for 4 pattern rounds (each identical, making this an easy portion to knit!) --I am going to expand it to 6 pattern rounds. (In the image, I have just completed 3 of the charted 4 rounds of the feather stems.) 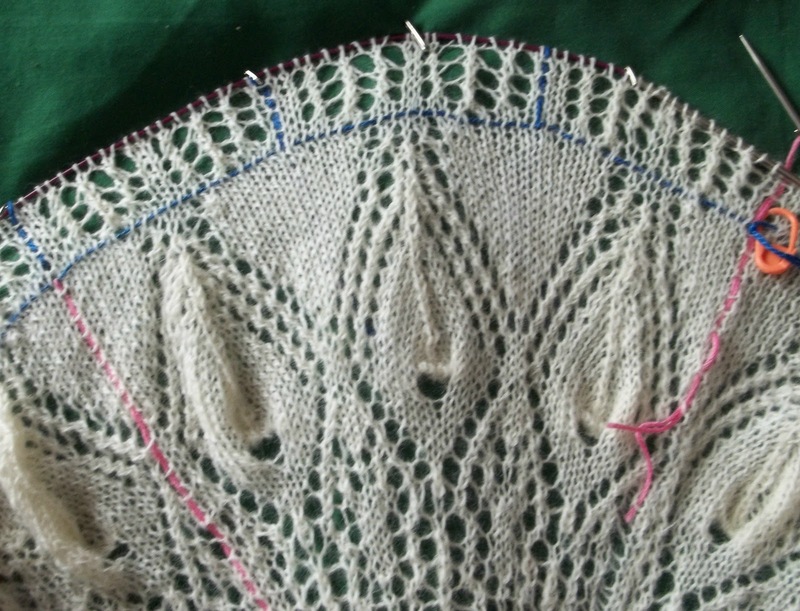 There are more than enough stitches to support a few rounds with just lace for ease, and not a increases. That loads of stitches! Really 10 to 12 increase every other round is plenty to keep enough ease in the design. With 120 stitch increase coming up, (and soon after that, the peacock feather eye with its massive 9 stitch increase (X 30 motifs!) there are plenty of stitches to go round! 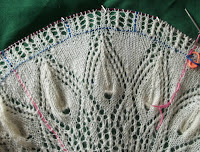 A extra rounds with just lace (which is amazingly stretchy) won't interfere with the ability of the shawl to lie flat. Of the 235 rounds, Chart 1 was the first 43 (44) rounds, Chart 2 took me to round 95, and then I added an extra plain round before stating Chart 3. As written, chart 3 ends with round 151 (152 after the plain round) , leaving 85 rounds in the last chart. My revision will increase rounds in chart 3 (by about 4, (2 pattern/2plain) and shorten Chart 4 by 8--(4 pattern/4 plain) the same. Not a huge change in the total number of rounds. When I get to Chart 4 —should I discover that the shawl isn't big enough-- there are directions for adding extra rounds--both in pattern and just plain rounds as an edging. I got some sewing done yesterday, too. The white skirt got it's pockets sewn on, and the side seams done, (edges finished and seams sewn) Now needs a light pressing before I continue with replacing the waist band—and then finally, the hem, since this skirt too, was too long and dowdy looking. Likely I'll get the ironing done, (and some other ironing that accumulated) but I don't think I'll finish the skirt today. Partly because I hope to get a few round of lace worked today, before I head off to Tuesday knitting—where I'll go back to the socks. (The light is OK at Manducatis—but the lace needs GREAT light.) There be a bit of extra knitting—with out a car, it's 2 subways to get to LIC. Or one subway and a long walk—Wait maybe I'll do that, and get some exercising in, too. Your lace work is lovely! I have two days out of my rat race this week, so I'm going to knit, too! BiL has vacation. Happy knitting! We are planning cement work, and soon I hope. The rains are over for the year.